Great Roman ruins in a lovely small Provençal town! There is also an interesting museum across from the theater, the Musée d'Art et d'Histoire. You can get a combined ticket with the Theater, and an audioguide is included in the price. Old Orange is an interesting place to wander. You'll see lots of narrow streets and archways, as well as the Cathédrale Notre-Dame de Nazareth, the main cathedral of Orange until the French Revolution. 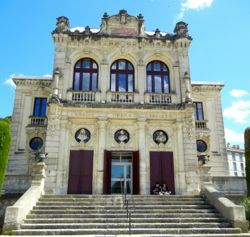 Other notable and interesting buildings include the Hôtel de Ville, a hôtel particulier dating from the 17th century; and the lovely Theater, inaugurated in 1885. "Modern" theater, from the 19th century. 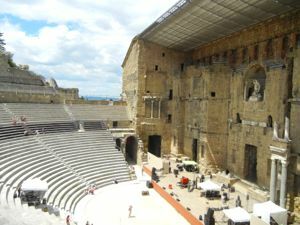 In the summer Orange hosts a variety of musical performances, including operas in the Ancient Theater and other events in this "modern" theater. Orange also is a great starting point for a fascinating day trip to the Caverne du Pont d'Arc and the Gorges de l'Ardèche. The Caverne presents some of the oldest cave paintings in the world, dating back 36,000 years. The Gorges or Canyons are the beautiful natural setting of cliffs carved by the Ardèche River. Here's a suggested day trip. Above, Ancient theater, from the 1st century. 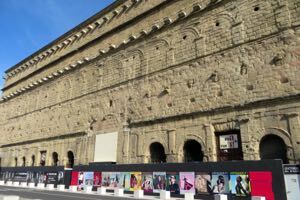 Below, The large and well-preserved stage wall.